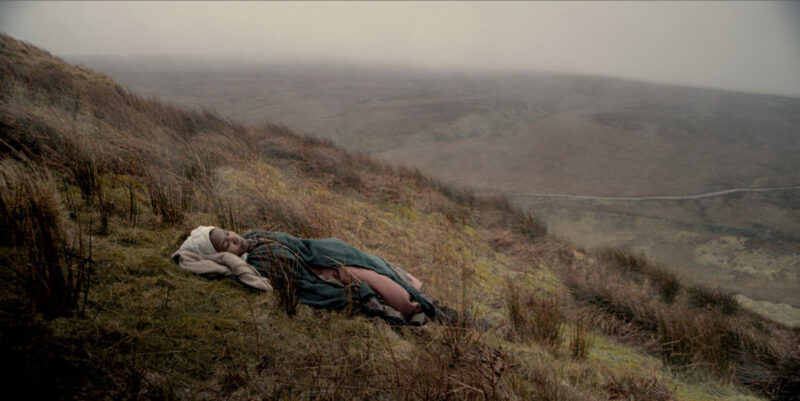 John Akomfrah was a key figure in the British Black Arts Movement active in the 1980s. While studying at Portsmouth Polytechnic, Akomfrah co-founded the Black Audio Film Collective in 1982 in collaboration with fellow students. Together they produced experimental films that explored black identity and political issues such as the racial tensions that led to riots in the UK during the early and mid-1980s. After the Black Audio Film Collective dissolved in 1998, Akomfrah co-founded Smoking Dog Films. Examining race, identity, cultural memory and the experience of diaspora through a lyrical aesthetic narrative, his recent films are at once politically engaged and poetic. Inspired by the depictions of a black man and woman drawn by Albrecht Dürer in the early sixteenth century, Peripeteia (2012) traces the appearance and disappearance of African lives in early modern Europe. In the film, two solitary figures move through a rugged northern European landscape, before eventually reaching each other. These shots are punctuated with historic photographs of African people in traditional dress and sections of the painting The Garden of Earthly Delights (ca. 1500) by Hieronymus Bosch (1450-1516), which includes black figures. In reimagining the ‘lost’ biographies of the individuals in Dürer’s portraits, Akomfrah explores memory, loss, and displacement. John Akomfrah (b. 1957, Accra, Ghana) is a British artist of Ghanaian descent. He has had numerous solo exhibitions, including The Whitworth, Manchester (2017); Turner Contemporary, Margate (2016); Nikolaj Kunsthal, Copenhagen, Denmark (2016); and Tate Britain, London, UK (2013-14). His participation in group shows has included The Place is Here, Nottingham Contemporary (2017); All the World’s Futures, 56th Venice Biennale, Italy (2015); and History is Now: 7 Artists Take On Britain, Hayward Gallery, London, (2015). In 2017 Akomfrah won the 7th Artes Mundi Prize in Cardiff, Wales.